Made this cute raccoon from Sanrio character. His name is Landry, he is a raccoon boy who loves to wash anything that he can get his hands on. His best friend is the rubber ducky called Pea. I never make raccoon for the bento so I thought this one would be great to try. My egg sheet didn't come as smooth as usual because I left them in the pan too long. But I think the wrinkles from the egg sheet made a bit of the texture for the raccoon so I just left it like that. Friday finally comes ... Hope everyone enjoy the weekend with friends and families! Kids will be sitting on the mid-test next week, so wish them luck. Hope they can get all the answers right. have a nice weekend too, Lia..
@hapabento : Thanks a lot Deb! @Yeapies : Thanks a lot for your kind comment! happy weekend to you and your family lia! @karaimame : Thanks a lot Karaimame! @megan : Thanks a lot Megan! @Anncoo : Thanks a lot Ann! @Just a MOM : Thanks a lot Lin! @OhayoBento : Thanks a lot Heather! wow!! Can you please teach us to make that egg flower! 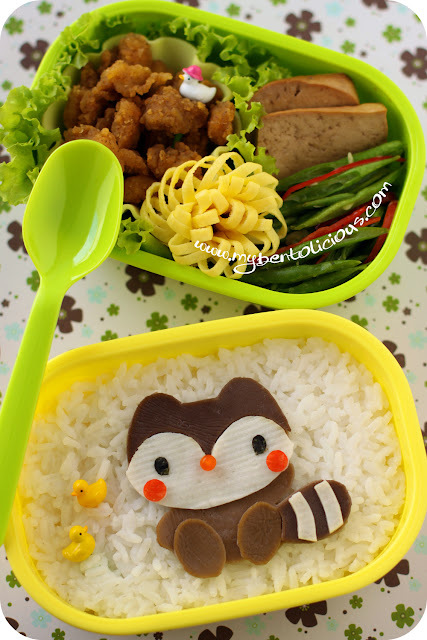 Amazingly creative lunches!! @noobcook : Thanks a lot Wiffy!